On days when I am in a hurry, breakfast smoothies are my best friends. The easiest smoothie recipe is to just throw in seasonal fruits along with almond milk (or any other milk/ homemade yogurt of your choice) and whizz them up in the blender. Banana is my favourite base for any fruit smoothie. It adds the morning nutrition and a lot of body and flavour. Oatmeal adds fibre and makes the smoothies more filling. Just a handful of old fashioned oats is enough for a glass. This oatmeal and banana smoothie keeps me going from morning till late afternoon on just one big glassful. And a mix of nuts & seeds makes the breakfast smoothie a complete meal as seeds are high in proteins. Chia and hemp are my two favourite seeds for adding in breakfast fruit smoothies. When in season, add in some fresh berries on top or used dried ones. Berries are rich in Vitamin C that is essential for our immune system plus they add that juicy freshness to the oatmeal smoothie. Bananas are rich in Potassium which is essential for our memory and muscles to function properly. Oatmeal is loaded with dietary fibre which is essential for a healthy digestive system and a healthy weight. Chia and Hemp seeds are rich in proteins which is essential for muscle building and repair. Fresh raspberries are great sources of Vitamin C which is important to keep our immune system strong and healthy. 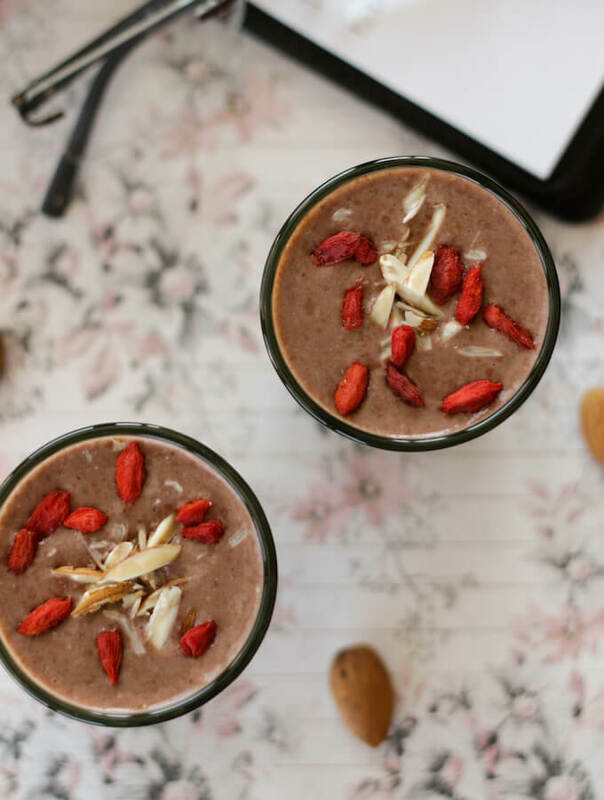 Chocolate is my weakness and I will take any reason to add it to my meal but a pinch of cinnamon would also go great with this banana smoothie recipe. 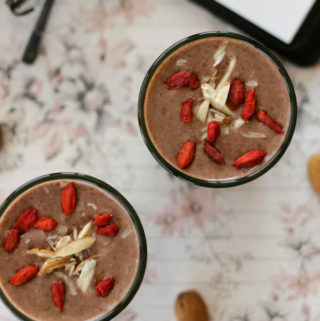 Tasty, quick and healthy, the chocolate oatmeal banana smoothie is a great breakfast smoothie that will keep you energised for long. With oats, bananas, and seeds; it is like the Duracell of all fruit smoothies! Blend all the smoothie ingredients in a blender to a smooth creamy consistency. 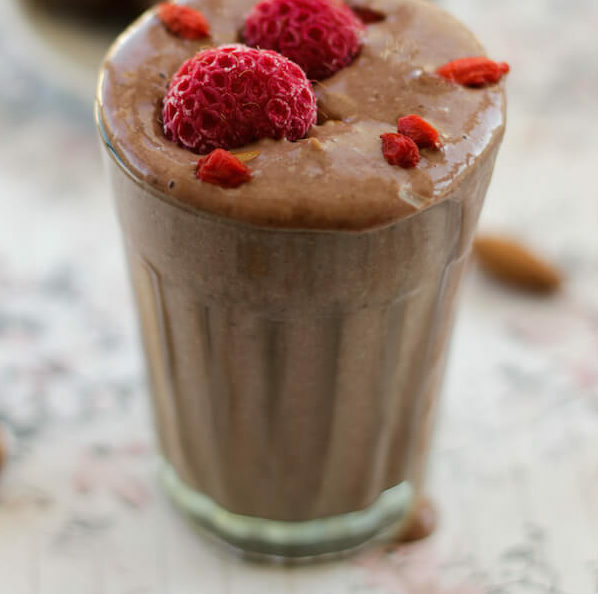 Pour into glasses and top with chopped almonds, dried berries and fresh raspberries. 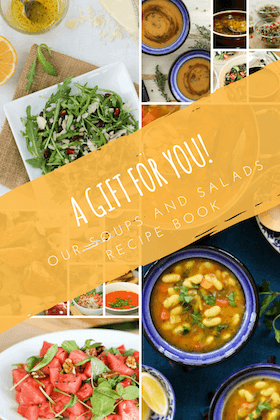 You can even make the smoothie with overnight oats. It will be much more creamier and pudding like, so add more milk for the desired consistency. Hi I have a question that chia seeds should be dry or wet? I use dry chia seeds in the smoothie but you can also use wet chia seeds. In fact, it will actually give the smoothie a much thicker consistency.